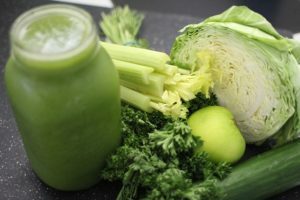 My recent 10-day detox inspired me to upload this recipe! I’m not a big fan of juicing, (check out why in this video!) I don’t always feel like a thick smoothie because I find them very filling. So I came up with a recipe for a juice made in the blender. I don’t quite have a name for it but I’m open to suggestions! You need a high power blender like the Vitamix, because normal blenders aren’t powerful enough to break up all the fibre. This is my favourite combo to help your body detox with powerful herbs such as parsley and coriander (cilantro) that have the ability to remove harmful substances from the body. Use as many organic ingredients as possible. Place all the ingredients in the blender and blend for 1 minute. Note: if your blender is powerful enough, you won’t need to strain it, the point is to keep all the fibre.